Fireworks and chocolate ice cream don’t look alike, don’t sound alike. My best guess is they don’t taste the same. But for the way they both possess the ability to delight even on those rare occasions that they’re underwhelming, these smile-inspiring fraternal twins of summer simply must be made of some of the same stuff. 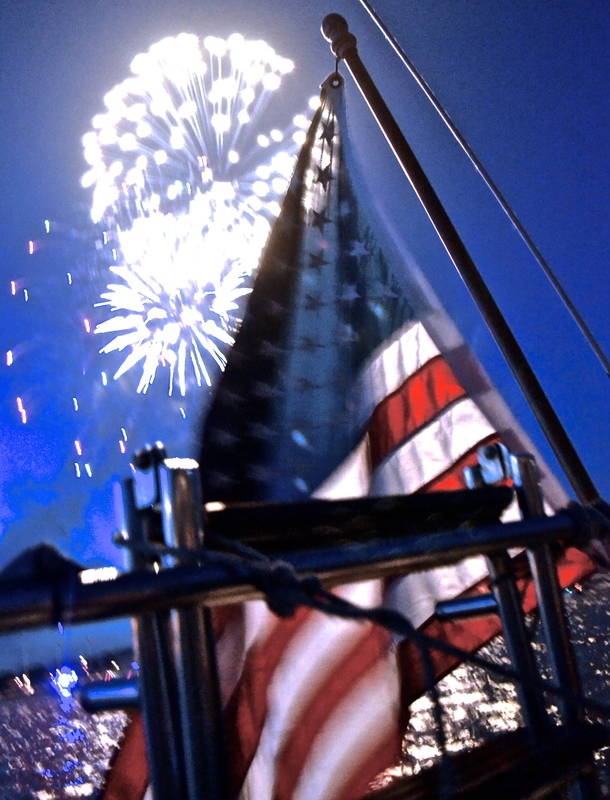 Among all the stunning pyrotechnic displays made in the American skies each 4th of July, there is none better than the show over the waters of the United States Naval Academy in Annapolis, MD. Give it a look some time, especially if you can do so from a boat anchored in the Chesapeake. For the full effect, pack your own Stars and Stripes to help set a mood like the one pictured below. America’s Birthday, 2014 is now in the rear view, but here’s the best flag-centric reading this weekend had to offer: a story from The Atlantic on The O.S.S.B, aka, The Original Star Spangled Banner, and via FastCompanyDesign, an illustrated biography of the American flag.